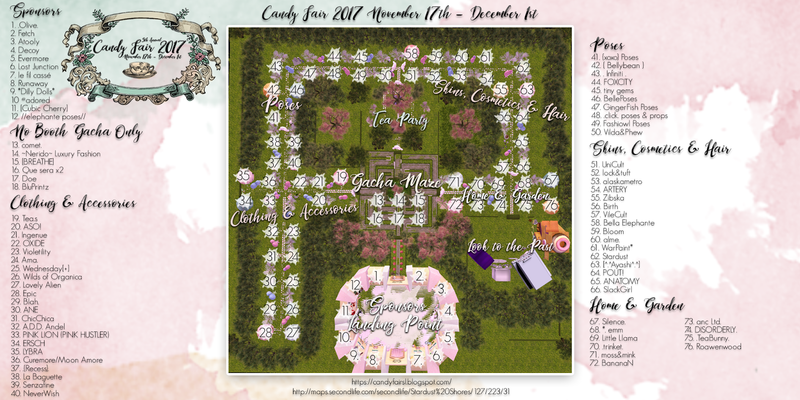 Candy Fair 2017 Giveaway Final Drawing & Last Day of Fair! 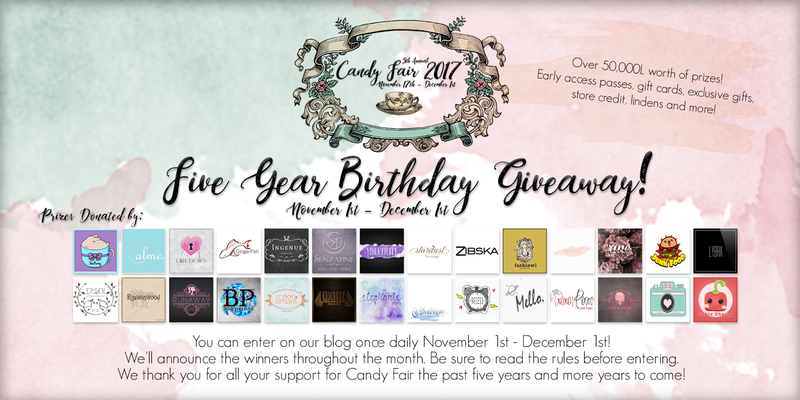 Candy Fair 2017 Five Year Birthday Giveaway Drawing #5 now open through the end of December 1st. This is our last and final giveaway for Candy Fair. Our biggest yet with $36,500L worth of gift cards, exclusive gifts and store credit! If you previously entered anytime since November 1st you are still entered for the giveaway! We want to thank everyone who entered we had over 300 entries in total throughout the month! Today is the last day of Candy Fair 2017! Be sure to stop by and check out the fair if you haven't already cause it won't return until the end of 2018! Thank you everyone who stopped by this year and we look forward to seeing you again next year! 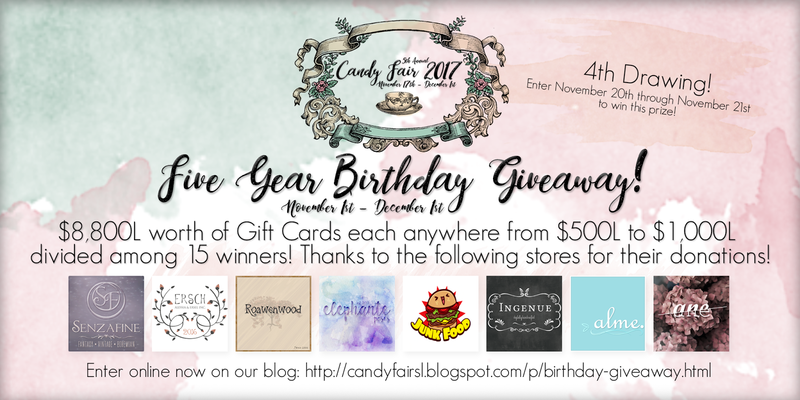 Candy Fair 2017 Birthday Giveaway Drawing #4 Now Open through November 21st! 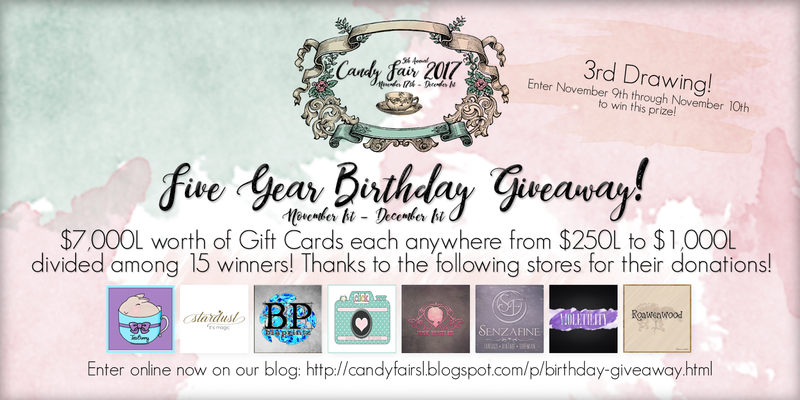 Our Candy Fair 2017 Five Year Birthday Giveaway continues! Drawing #4 for the giveaway is a chance to win one gift card anywhere from $500L to $1,000L to shop at the stores of those sponsoring this drawing! In total the worth of everything being given away its $8,800L. This drawing round will have 15 winners! Many of the stores have donated more than one gift card. You have through November 21st to enter! Don't forget if you previously won in the contest you are no longer able to enter. If you previously entered earlier since November 1st you are still entered and can enter ONCE daily through December 1st! Thank you to the following sponsors for donating gift cards! 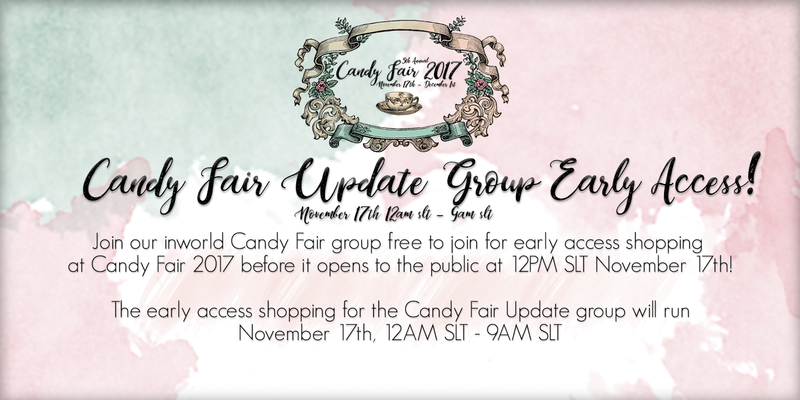 Candy Fair 2017 Now Open through December 1st! Don't forget to look for our birthday cake throughout the fair in the designer booths. Many designers have provided free birthday gifts for the fair in honor of Candy Fairs 5th bday! Last but not least don't for get to enter our birthday giveway going on through December 1st more info on that at the end of this post! Cassie Middles Shopping Tour Vlog! 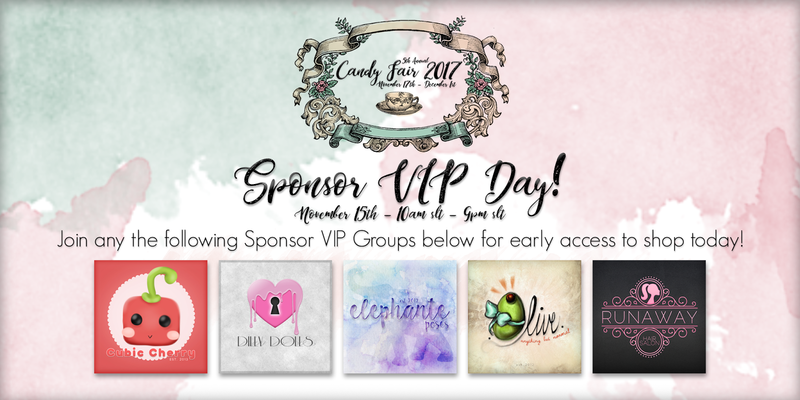 Candy Fair 2017 Sponsor VIP Day! 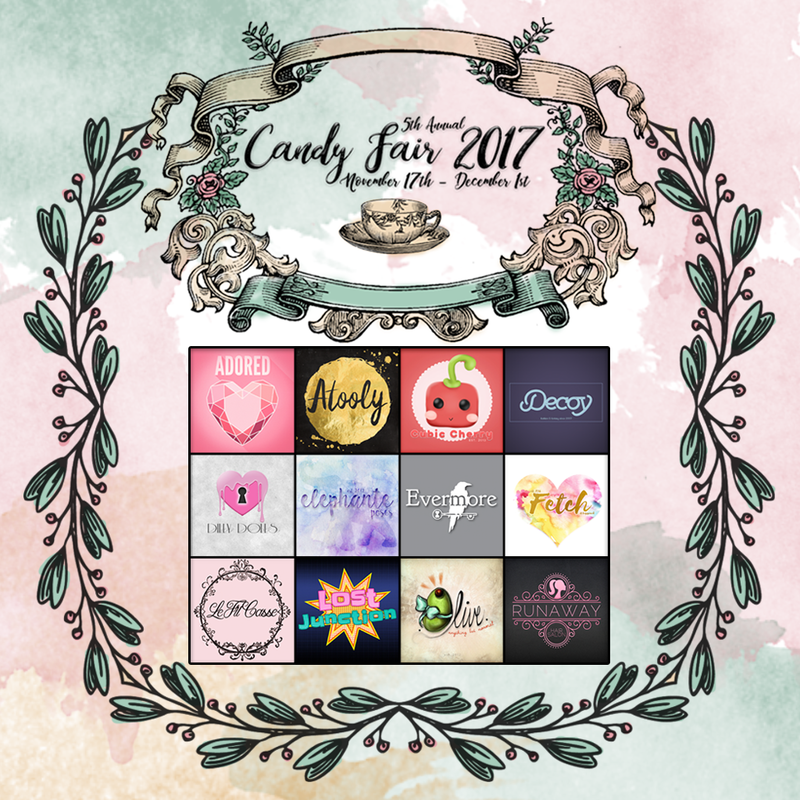 Candy Fair 2017 is giving early access to some of this years sponsors VIP groups! Sponsor VIP day for early shopping is now open November 16th 10AM SLT - 9PM SLT. We hope you take advantage and join some of our wonderful sponsors groups to get some early shopping in before the public! Enjoy! Below you will find a list of some of the Sponsors VIP Groups you can join to gain early access for our Sponsor VIP Day! Candy Fair 2017 Birthday Giveaway Drawing #3 Winners! Congrats to the winners of $7,000L in total gift cards divided among fifteen winners! Each winner received a gift card provided by our sponsors! Thank you to everyone who entered! Don't worry there are many more chances to win. If you entered for the our previous drawings you are still entered for future drawings. You may reenter your name once daily! Good Luck everyone! Thanks to our sponsors of this drawing for donating the gift cards! 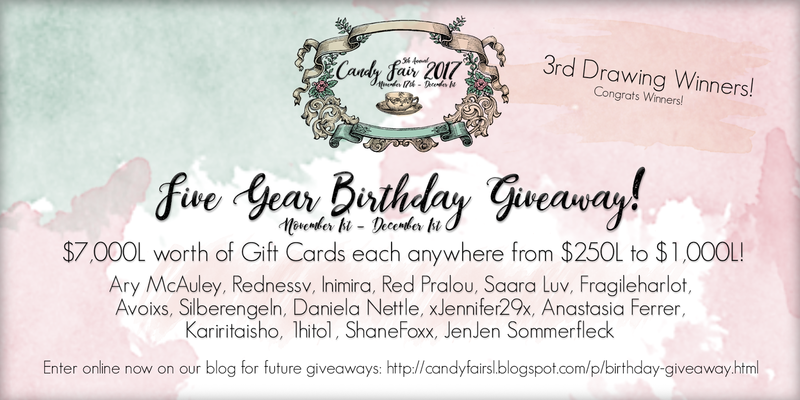 Candy Fair 2017 Birthday Giveaway Drawing #3 Now Open through November 10th! 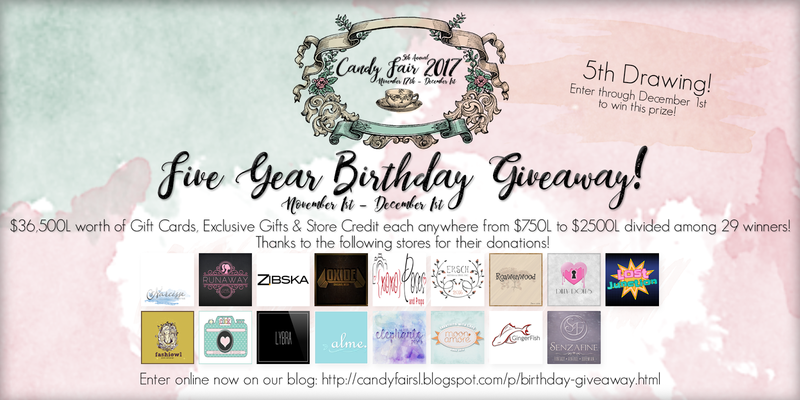 Our Candy Fair 2017 Five Year Birthday Giveaway continues! Drawing #3 for the giveaway is a chance to win one gift card anywhere from $250L to $1,000L to shop at the stores of those sponsoring this drawing! In total the worth of everything being given away its $7,000L. This drawing round will have 15 winners! Many of the stores have donated more than one gift card. You have through November 10th to enter! Don't forget if you previously won in the contest you are no longer able to enter. If you previously entered earlier since November 1st you are still entered and can enter ONCE daily through December 1st!